This is the first recipe I tried out as part of my 101 in 1001 challenge. So to kick off (and in a somewhat unsuccessful attempt to lure the summer sun to the Western Cape), I've decided on the Vietnamese Chicken Salad out of Bowl Food. It was nice and refreshing, although I made a note to self to keep a closer eye on the chicken next time, as it was slightly overdone. I added a few tweaks here and there, like stirfrying the chicken strips in lemon juice instead of poaching the whole breasts in lemongrass-infused water, and also adding a dash of plumsauce right at the end for moisture, but all in all the recipe stayed mostly the same. 1. Place the chicken and lemongrass in a deep frying pan of lightly salted water. Bring to a boil, then reduce the heat and simmer gently for 8 - 10 minutes or until the chicken is just cooked through. Drain and keep warm. 2. Place the fish sauce, sugar, lime juice and sweet chilli sauce in a small saucepan and stir over medium heat for 1 minute or until the sugar has dissolved. Remove from the heat. 3. Place the cabbage, carrot, onion, coriander & mint in a large bowl and toss together well. Drizzle over 3/4 of the warmed dressing, toss to combine and transfer to a serving platter. 4. Slice the chicken thinly and diagonally arrange over the top of the salad and drizzle with the remaining dressing. 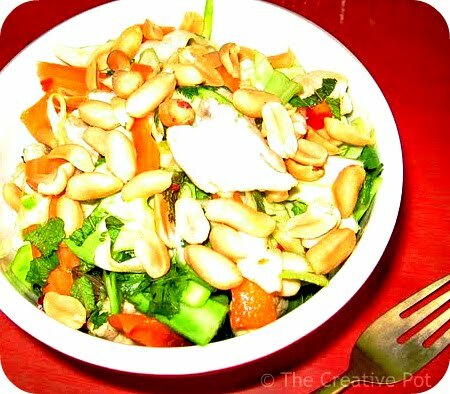 Garnish with the extra coriander leaves, chopped peanuts & fried shallots. Serve immediately.